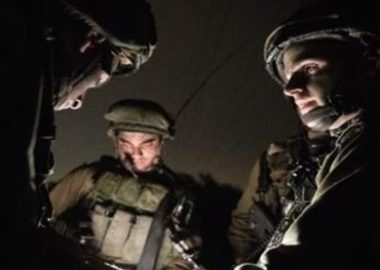 Israeli soldiers abducted, on Saturday evening, a child and a young man from Qalandia refugee camp, north of occupied Jerusalem, and south of Ramallah, while Illegal Colonists attack cars, west of Ramallah. Media sources said the soldiers stopped and interrogated the two Palestinians, who were walking near the Qalandia Terminal, and abducted them. They added that the abducted Palestinians have been identified as Mohammad Awni Aslan, 16, and Abdul-Malek Hasan Abu Latifa, 19. In related news, illegal Israeli colonists hurled stones at many Palestinian cars near Ras Karkar village, west of Ramallah. The cars were driving on Wadi el-Delb road, near Ras Karkar village, when the colonists attacked them, causing damage. After the attack, Israeli soldiers closed the road to Palestinian traffic, all the way to Ein Ayyoub Junction, west of Ras Karkar, while Israeli colonists were not even stopped and continued to use the road. In related news, dozens of illegal colonialists hurled stones at Palestinian cars driving at the junction of Gush Etzion colony, north of Hebron, in the southern part of the occupied West Bank, and shouted insults and threats at the Palestinians.